Connecticut » Blog » Water Damage Restoration » Water Damage Connecticut: A Casual Mishap or a Haunted Toilet? Water Damage Connecticut: A Casual Mishap or a Haunted Toilet? Connecticut is one of the wealthiest states in America but did you know it is also one of the most haunted? Places like the Union Cemetery, Dudleytown and Remington Arms are just a few of the most notable haunted locations. 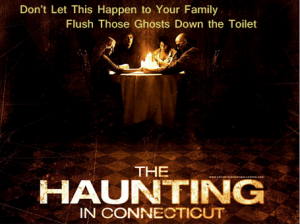 Since almost everything in Connecticut appears to be either wealthy or haunted, what does this say about your toilet? Perhaps you’ve had several recurring toilet issues that led to water damage but are they a mere coincidence or signs of a ruthless ghost? Let our water damage Connecticut team investigate for you. Wait a Second, How Did the Toilet Clog? You wash your hands with flower scented soap, turn towards the door and suddenly realize that you are standing in a pool of toilet water. When you walk over to check the toilet, you notice it is clogged with an unusual amount of toilet paper. “But I’ve only used one sheet,” you think to yourself. Suddenly, the room is filled with toilet water so you spend hours mopping it up. Unfortunately, several days later you find the white washed wood on the bottom of the walls rotting at a rapid pace. In any other state, this could potentially be a strange scenario but in Connecticut, chances are it’s a haunting. Our team of water damage Connecticut experts will not check for ghosts but we will check for water damage. It’s best to contact our team immediately before mold comes into the picture. Where Did This Leak Come From? Something that rarely happens is discovering a leak in a brand new toilet. Realistically, how could a toilet have a leak when it was just purchased? Well, if you are in Connecticut and are experiencing a leak in your 1-day-old toilet, you should contact our water damage Connecticut experts…and check for ghosts. It could be the same pest who clogged your toilet the first few times. A leak that drips consistently ends up leaving pools of toilet water on your bathroom floor. The water will soon seep into a crack and crevice, causing mold damage. Mold then leads to serious medical risks so it’s highly recommended to get the leak fixed sooner rather than later. While you’re at it, get the haunted toilet part straightened out too. Check out movies like The Haunting in Connecticut to see how they destroyed evil.